I remember going to visit LA one time on a road trip in college. It was early spring and my roommates and I left some chilly, wintery weather and drove 12 hours to summer. Or at least that is what it felt like. It was so nice to feel sun on my face and not bundle up before going outside. I was born in the LA area but my parents moved to Vermont when I was just a year and half and I remember calling my mom after spending the afternoon on the beach and asking her why the heck they had ever moved. It just seemed like eternal summer was the way to go. What I didn't realize at the time, though, was that the change of season is pretty ingrained in me. I've lived all my life in a Northern climate and come September time, I'm ready for colder weather. I want colder weather. I want a crisp breeze and leaves falling and wearing light coats in the morning. This is the time of year that drives me crazy, then, because fall will tease me for a few days, then it will get hot, and then it will cool down again and tease me some more. I keep telling myself not to go jumping into fall activities because I really should be savoring what is left of summer. And then I try to figure out how to wear my new cardigan to work the next day without breaking a sweat walking from my computer to my lab bench. In my mind, this salad bridges that not-quite-fall-but-not-quite-summer gap pretty well. It has potatoes, which taste like fall to me, and green beans, which highlight late summer, and a pesto sauce that I pretty much eat year round. If you're lucky enough to have grown basil and made pesto this summer, this would be the perfect way to use some that you've stored away. It's a very simple, fast recipe that makes a good end-of-the-summer-BBQ side dish or a make-ahead lunch. Go ahead and ignore your cravings for pumpkin and sweet potatoes for just one more day and enjoy the taste of fresh green beans and pesto. Winter will be here before we know it. You know, eternal summer may not be all that bad. Place potatoes in a large pot of water; bring to a boil. Add salt and cavatappi or other short tubular pasta; return to a boil; cook 2 minutes. Add green beans. Return to a boil; cook until vegetables are tender and pasta is al dente, about 6 minutes. Drain; toss with pesto; season with salt and pepper. Serve warm or at room temperature. As a midwesterner, I totally agree with your love of the seasons, especially fall. I lived in NM for a year and could never adjust to the lack of seasons there. 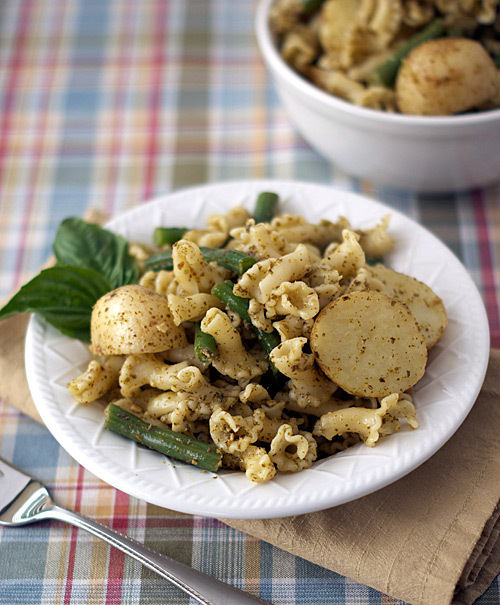 Potatoes and green beans are an awesome combination and I love how you took it to another level. Yum, I LOVE pesto! :) Love your blog! This looks yummy! I'd love to try it with some chicken to make it a complete meal! Yum, yum! Yum! That looks like one tasty salad! I just bought that same pasta the other day and love how the sauce just clings to it. Looks delicious! I'm normally all about embracing fall as quickly as possible but I really am going to miss summer veggies this year...I think I need to make this pasta to really see them out properly. I am an eternal summer girl all the way...which is why I must figure out how to move out of this climate some day! haha although, I will admit, there are a few things I enjoy about fall...winter...not so much. The salad looks wonderful! How can you go wrong with such simple, great ingredients? Looks great! I recently made a pesto pasta salad with chicken - such a great combination. I sometimes think it'd be really nice to live somewhere warm year round, but I know I'd miss the changing colors of the leaves and the first snowfall. At least for the first few years away from it :) Love the simplicity of this dish, looks great! Your pictures are always so beautiful. The recipe looks so different and delicious. the pesto and potato salad are looking amazing. loved it and wud surely try it. thanks ! Nicole, your pictures are looking fantastic. Nice recipe, too! Such a beautiful salad! Yum! I'm totally with you about what a tease fall can be! It's my favorite season and I'm so ready for it, but it always takes forever to really get here. We've had perfect temps the last few days but I know it's going back up to the 80s next week. Anyway, this is just the recipe I needed! I had potatoes and beans and basil in my CSA box this week. Now I know what to make! I think I'm going to throw in some corn, too. Yum.